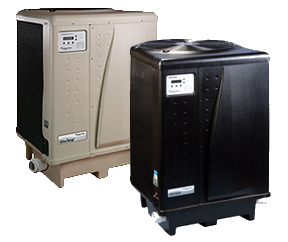 Compared to gas, oil or electric pool heaters, the UltraTemp heat pump uses just a fraction of the energy to generate the same amount of heat. Pentair heat pumps have been using the EPA-recognized, environmentally safe, non-ozone depleting R-10A refrigerant for nearly 10 years, allowing the UltraTemp to be awarded the Eco Select Brand for environmental responsibility. The UltraTemp heat pump also provides you an AutoSet Temperature Control feature as a standard. It monitors water temperature and turns the pump on and off as needed, overriding the time clock to maintain desired temperature. It also features the legendary Emerson Copeland Scroll compressor that’s more efficient, durable, reliable and quieter than any piston-driven compressor. 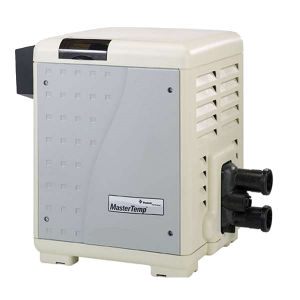 MasterTemp® offers all the efficiency, convenience and reliability features you want in a pool heater, plus a lot more. As easy to use as your home heating system, plus, user-friendly indicator lights make system operation and monitoring a snap. The compact design and super quiet operation won’t intrude on your poolside leisure time. This unit heats up fast, so no long waits before enjoying your pool or spa. Its Best-in-class energy efficiency has a manual gas shut-off when service is required, a rotating digital display that allows for easy viewing and is tough enough to weather the elements. FAFCO solar pool heater dramatically extends your swimming season, enabling healthy enjoyment and exercise in luxurious warm water from spring to fall. We use Fun in the Sun because they have provided environmentally friendly products and reliable solar heating systems throughout Orlando and surrounding counties for over two decades. They are a proud factory trained and authorized FAFCO Dealer. FAFCO are rated highest in performance in the solar industry and their panels are lightweight, ultraviolet resistant and deliver unmatched protection against cracking and fading. The major advantage of a solar pool heater is that because sunshine is free and it has no operating cost. Another advantage of a solar pool heater is that solar energy is renewable and non-polluting. 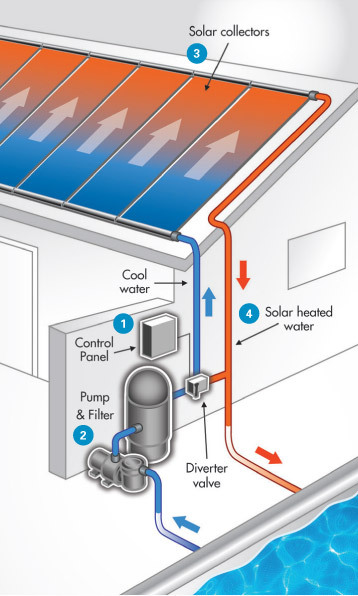 The major disadvantage of a solar pool heater is that solar does not provide heat on demand. In other words, the solar pool heater can only put into the pool the heat which is available from the sun on any given day. You cannot make more solar energy the way you might burn more gas or use more electricity to maintain your pool’s temperature. So why, you ask, doesn’t every pool have a solar pool heater system? Solar pool heating systems do require an initial investment of $3,000 to $5,000 for a typical 300 to 400 square foot surface area residential pool with no special installation requirements…but a properly sized system with a life span of 15-20 years can pay for itself with energy savings in 2-to-3 years. While there are only small differences in the heating performance (BTU per square foot of solar panel) for most of the solar pool heating panels on the market today, a variety of factors can cause significant price variations. One is that solar systems which face south require fewer panels then systems which face east or west. Another factor is desired swimming season. When comfortable swimming is desired during the colder winter months, more panels must be added to the system in order to collect the additional heat needed each day to offset colder air temperatures and reduced solar energy available. Different mounting methods, warranties, esthetic touches, and electronic control systems are other options to be aware of. Because solar heating technology can be confusing to the average pool owner, it is advisable to contact a state certified solar contractor when you look into solar heating. Solar blankets are one of the most cost effective elements of any heating system addition. 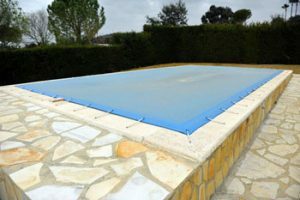 Since 70% of all heat loss from a swimming pool is evaporative and convective a simple vapor barrier with an added R value such as a pool cover can cut almost all of these losses. The net result is a savings of 65-70 % in heating costs or a much greater net gain in energy when using a solar system.